I like to stock up on food items we use often especially when I can use coupons and find them on sale. There are many commercial can rotators available but frankly I would rather spend money on more food storage then a piece of plastic. I found several patterns online to make cardboard can rotators and after some trial and error and a little tinkering I came up with this cardboard can rotator that is literally made with just cardboard, popsicle sticks and glue! The ones I have made have held up perfect for the last 8 months. I have done 3 at the same time assembly line style and it takes about 1 ½ hours. This would be a fun project to involve your kids with for some of the easy steps. Most of that time spent is actually waiting for glue to dry! You can take a label or just write with a sharpie marker the “Name” of the product can in each rotator. Each rotator will hold approx. 15 cans like vegetables or fruit, and about 20 or more smaller cans like Campbell’s soup. 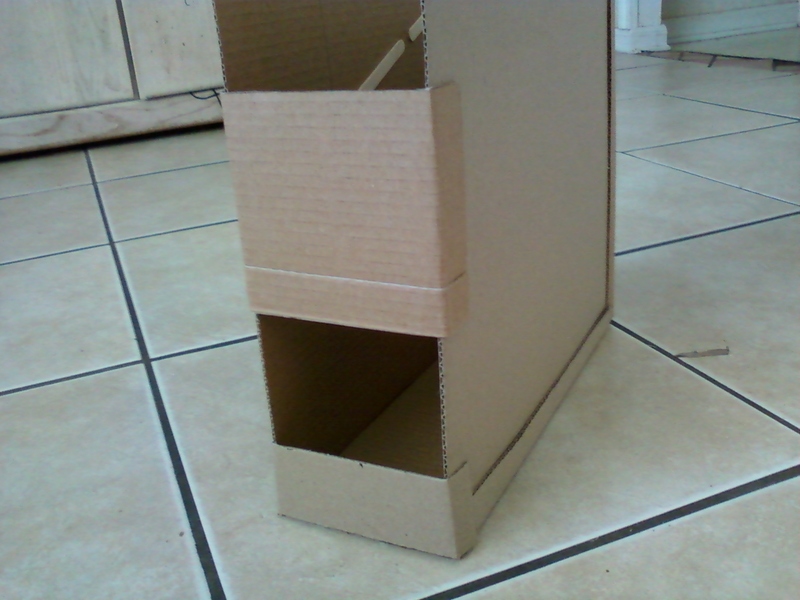 Supplies: You can use any cardboard boxes you have but I have found those that are used and bent are harder to use. You can easily purchase a 14x14x14 box in the office section of Wal-Mart for approx. 67 cents. They are perfect to use for this project! #1: Starting from the top right corner measure 10 inches across the top and then draw a line 4 inches down from there. From the bottom of that 4 inch line draw a straight line up to the top right hand corner (making a triangle). 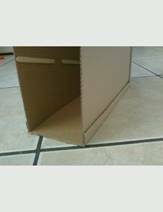 #2: Then on the same piece of cardboard start at the bottom left hand corner and measure across the bottom 10 inches and draw a line up 4 inches. Go back to the left hand bottom corner and measure straight up 6 inches and mark a small line. Take that small line and draw a line down to where it meets the 4 inch line you just did at the bottom. #3: Then from the bottom right hand corner measure straight up 2 inches and mark a small line. Then go back to the bottom right hand corner and measure 3 inches along the bottom and mark a small line there. Draw a line between the two small marks. 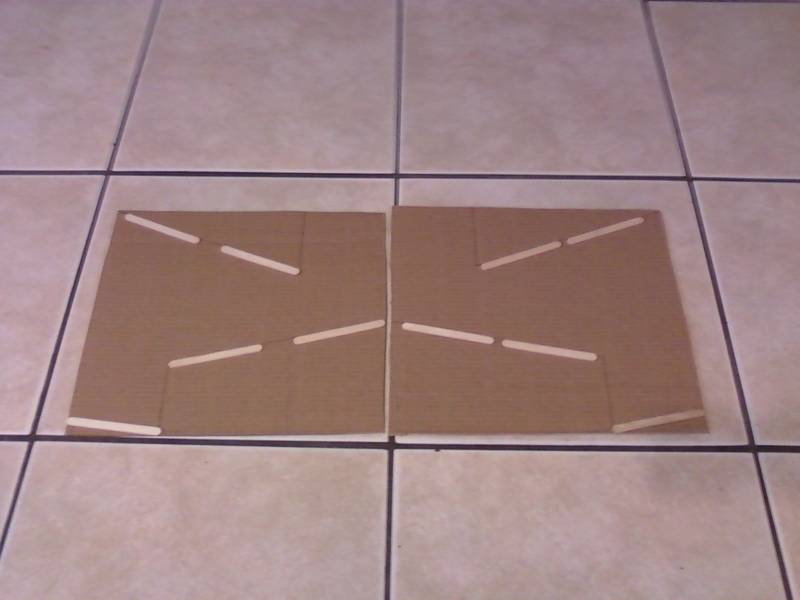 Repeat this same step on the left side cardboard piece but you will change the directions you start with so you basically are making a mirror image of the right cardboard piece. Step 2: You then will glue 2 popsicle sticks directly under each of the top two lines and then on the bottom line glue just one stick (See picture) and then set aside to dry. Step 4: Take one of the 7×14 panels and put glue on both of the turned up sides and glue the 2 14×14 panels to it and set it aside to dry (you can set a book on it to help it hold together and dry). Step 5: Once the back panel and two side panels are dried stand them up and fold it in. Taking the other 7×14 panel put glue again on the folded up sides and place the side/back panel pieces inside of it pushing the bottom of the side panels against the folded up sides of the bottom panel. You can use chip clips to hold them together or keep pressing them together until they dry. 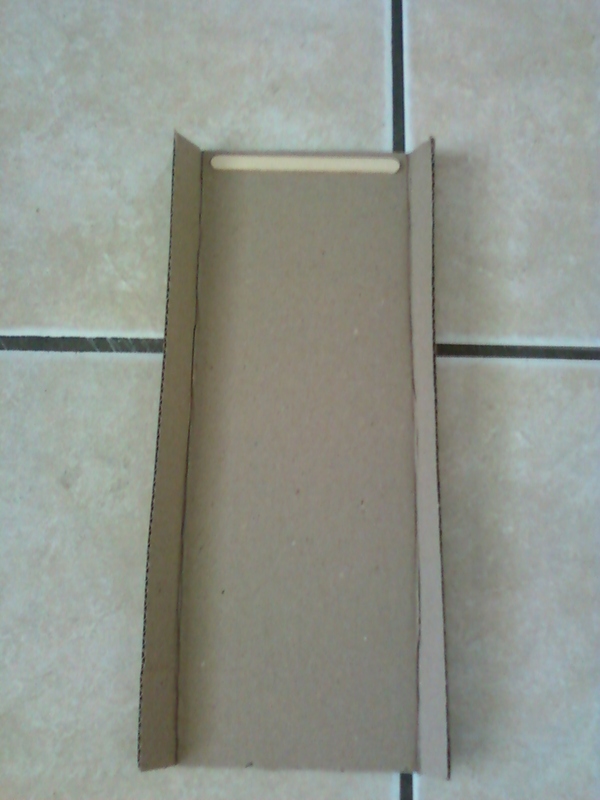 Step 7: Put glue on all the tops of the popsicle sticks and just above them along the sides of the cardboard box. Taking your 2×5 piece lay it on the very bottom row of popsicle sticks where it rests on the sticks. Press down so it will glue onto the popsicle sticks. Glue all around the edges almost like your caulking the corners with the glue. Repeat this step with the next row of popsicle sticks with one of the 5×11 pieces, and then finish with the top row of popsicle sticks with the last 5×11 piece (this will also rest on the popsicle stick on the top of the back panel). Make sure you put glue around all the edges. Lay the can rotator on its side and place a heavy book on it to help press everything together. What ideas do you have for storing cans and other non perishable food items? Make The Freezer Your Friend! What is in your freezer? I spent years packing my freezer with prepackaged items or foods that required preparation to make a meal. I was completely ignorant of all my freezer could offer me.Your freezer should be your friend and a place where quick meals reside. This doesn’t have to always include the prepackaged “convenience” foods. What do I mean by that? Those are the prepackaged items you just heat and eat that are often high in calories and fat or often contain additives and preservatives we certainly could do without. My husband jokes with me sometimes that I “heated that meal really well”. For example I will do frozen chicken fried steaks that just have to be heated along with making instant potatoes, gravy from a powdered mix where you just add water and stir, and then usually a bag of frozen Steam Fresh Vegetables fixed in the microwave. So nothing is fresh and there was really nothing that I had to “prepare”. Oh it is convenient alright, but what about a real home cooked meal? Everyone’s time is precious so making a real home-made meal can often be time-consuming and certainly not practical on busy nights. On those busy nights it is too easy to do the prepackaged warm and serve meal or even just stop by McDonald’s or other fast food restaurants. This was when the light-bulb came on that it was time to change how I utilized my freezer so that on those busy nights we can still try to have a good meal. 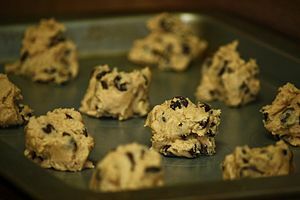 I found that on a day I had time to cook a home-made meal that I can often make a double batch and freeze the other half. Foods like Chili, Soups, Beef Stew and even Spaghetti Sauce. You are already there doing the work so it really isn’t hard to just do a double or even triple recipe. I found that dinners we normally will have leftover will not get eaten that week but if I freeze them we can make a new meal out of it later. For example we never eat more than half the pan of Lasagna so I freeze the other half. I can take leftover Brisket or barbeque cut into small pieces and use for baked potato toppings another day. What other conveniences can your freezer offer? If you save leftover vegetables and meats they can be used in casseroles, soups, stews or a stir fry later. When you find chicken on sale buy it! You can boil the chicken, shred or cube it, and freeze it to use for a variety of meals later. You can also take the broth from the boiled chicken and spoon it into muffin tins and place that into the freezer. When the broth is frozen pop them out and store in a freezer bag and these little broth “cups” give you about 1/2 cup of fresh chicken broth. You certainly can cook other meats to freeze and use later also. If you have left-over pasta store it in the freezer for soups and casseroles later. All of these things will help cut down on food prep time when making those home cooked meals. Even more ideas? How about storing butter and cheese? I do. We certainly stock up on meats and other items that can be frozen when on sale. This makes it easier to cook those larger batches of meals later by already having the ingredients. We also store bottles of frozen water for emergencies. After being in a hurricane and then without power for a few weeks we found the huge need for this. 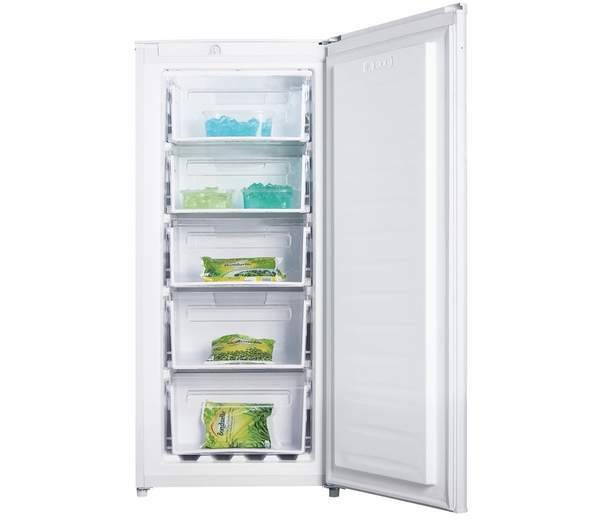 When the power is out that frozen water will keep your freezer/refrigerator colder, longer. What freezer friendly ideas do you have? 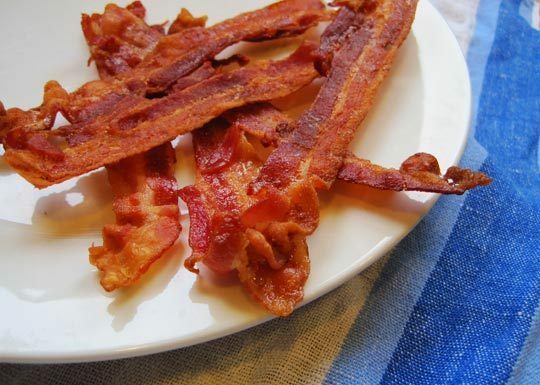 What would get you literally jumping out of bed in the morning more than the smell of bacon? Isn’t the world just a better place when bacon is involved? Chef’s have dedicated entire cookbooks around this one ingredient! Seriously doesn’t everything taste better with bacon? There is a whole industry that pays tribute to bacon! I got my husband a t-shirt for Christmas that says “You Had Me at Bacon”. There were a dozen other clothing items to choose from all centered around bacon. If you search Amazon you will find all types of gifts that claim to look, smelling or taste like bacon. There is the Bacon Air Freshener, Bacon and Maple Syrup Lollipop, Bacon Bandages, Bacon Flavored Toothpicks, and Bacon Lip Balm. How about carrying around your money in a Bacon Wallet? If you just can’t get enough bacon flavor why not try adding a variety of Bacon Salts or Bacon Hot Sauce? You can even give your loved one the gift of Bacon Roses for your next special occasion! We usually have several packages of bacon in our freezer which has become a staple in our home. During Hurricane Ike our power was out and the very first morning our neighbors were out bright and early cooking bacon in their backyard. Being summertime in Houston with no power meant everyone had their windows open to get some cooler fresh air. Of course that bacon scent just wafted into our home sparking the question from everyone, “do we have any bacon”? Sadly no we did not and that quickly went on our list of supplies we will always keep on hand for any emergency! I really try to stock up when I can find a coupon or can price-match at Wal-Mart the sale price from another store. I have several recipes that my family loves that include bacon like Baked Potato Soup, Chicken Carbonara, and a Stuffed Chicken Breast. We often do a breakfast style dinner and it always includes bacon! My biggest obstacle though is when I fix bacon for these dishes I find I need to make extra otherwise as I am cooking it starts to disappear when my back is turned and I am left with little to use for the recipe. Do you have also have an obsession with bacon? Please share your recipe ideas too! Spray Away a Bad Hair Day? I hope I am not the only one who is lucky to at least find the time to fit a shower in every day. I know there are days my time is so short that washing, drying and fixing my hair just is not happening that day. In years past I had long hair and those were the days it just got thrown into a pony tail, but now I have much shorter hair and that isn’t an option anymore. I recently had filled out a survey online for Suave Hair Products and they sent me a coupon for a free bottle of Suave Dry Shampoo. I will try anything if I can get it free! It is a good call by companies like Suave to do that because I have become a loyal buyer of many products after trying them while I may not have tried them without the free coupon. So back to fixing a bad hair day. 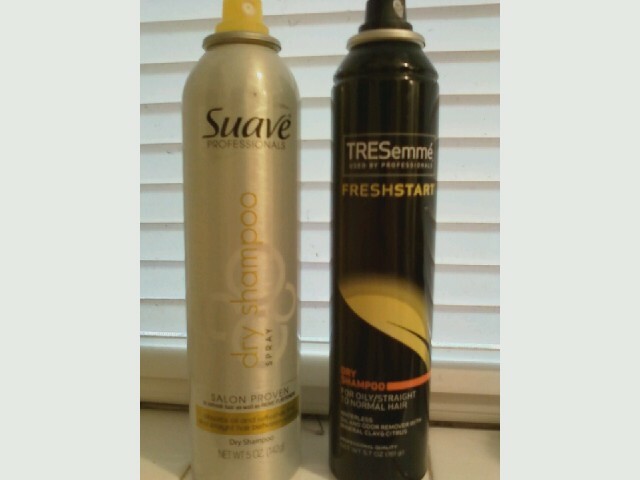 I did get the free bottle of Suave Dry Shampoo and I was hooked on the first use. Dry shampoo absorbs excess oils in your hair to make it look and feel less greasy and more refreshed. The fragrance is very appealing too! You simply just spray it into your dry hair, rub the scalp with your fingers, comb through your hair and then style as normal. Although it isn’t exactly the same feel as freshly washed and dried hair it is a major improvement from having heavy, dirty or greasy feeling hair. The Suave Dry Shampoo is made with mineral clay but other brands may have different ingredients that are to accomplish the same result. I do like the Suave brand which is reasonably priced but I also have tried TRESemme Dry Shampoo when the store was out of the Suave brand. What do you do to improve a bad hair day?